Our exploration trip is back this year: The Great Expedition 3304! Last time, we completed around 70 000 light years together from Tellus, direction the Orion-Cygnus minor spiral arm, Perseus arm before transitioning into the Orion Spur. Colonia, Saggitarius A* and a rapid tunnel home. For 3304, we will run counter-clockwise with new amazing destinations to discover! Take your time, you have 2 months to complete this expedition. If you haven't fully equipped your ship yet, Pellegrino Station - Bragurom Du, provides your with everything you need to prepare your ship, suits, safety tools and provisions. Please tell us in the _#Communautéfr if you are taking part in this expedition, your preferred language (EN/FR) and if you want to play an active role as a Refueler and/or Repairer. Are you ready for a Great adventure pilots? Incredible shots, fame, credits and objectives to complete await! That's where we'll start, together! QZ Carinae (also called HD 93026) consists of three massive and highly luminous O-class stars, with a total of 121 solar masses. As seen from Sol, this system appears as one of the brightest stars in the Carina Nebula. x Carinae (also V382 Carinae) is a yellow hypergiant in the constellation Carina. At 700 solar radii it is the 10th largest known star by radius and the brightest of the rare yellow hypergiant class when seen from Earth. The x Carinae system also contains two smaller stars and a single gas giant providing great views of the hypergiant at 3500 light-seconds. Visitors should note that Universal Cartographics has both an "x Carinae" and a "X Carinae" (note capitals on the "X") in their database. Use the alternative reference of HD 96918 to avoid confusion. Sitting at the southern edge of the Circinus Transit, these powerful and young triplets act as a navigational aid for travelers crossing the galactic arm as they remain visible from light years away. First discovered in 1974, TrA X-1 was classified as an x-ray nova, a source of extremely bright and brief x-ray emission. At peak emission this nova produced almost as much x-rays emission as the Crab nebula. These sources were believed by early astronomers to be caused by matter falling into a black hole, and is confirmed by recent survey which found three separate black holes in a co-orbiting system. 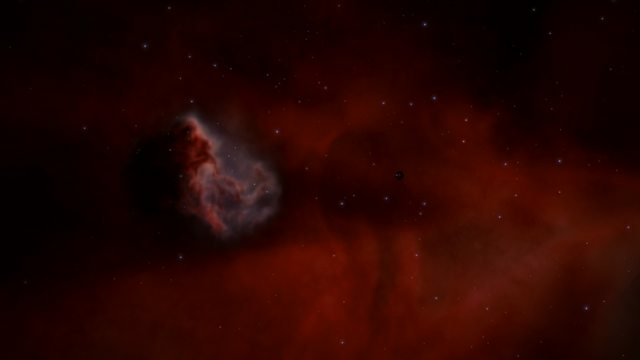 One of the Gallipolis Nebulae. 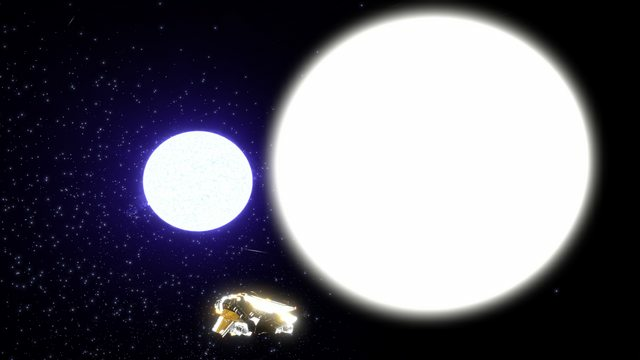 7,000 LYs from the core, this system holds two of rare herbig ae/be stars. The "eyes" rotate at an incredible speed in an effort to see everything. A red giant star system situated at the edge of the outer galactic core and sitting 1,700 LYs above the galactic plane. Its vantage point gives visitors a breathtaking glimpse of the expansive galactic core regions below and stretching out across 10,000 LYs to the distant Far 3kpc Arm. Feel free to venture even higher! 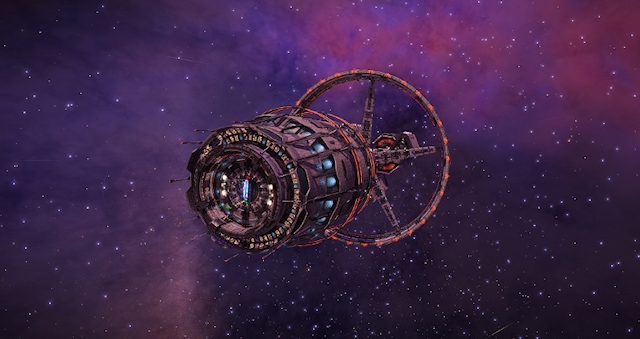 This system houses 6 T-Tauri stars, each with its own ring, providing a series of stunning views set against many bright stars in the central part of the Galactic Core. One of the smaller planets also has an interesting ring system, with its angle of inclination almost exactly perpendicular to its orbit, so that the rings are face-on to the central star. 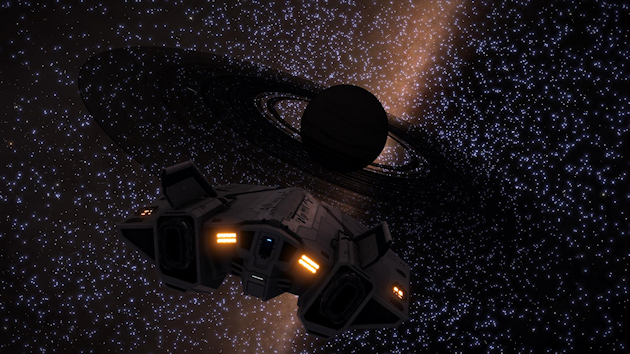 Orbiting a black hole you will find a neutron star with both a metallic and a rocky Ring. 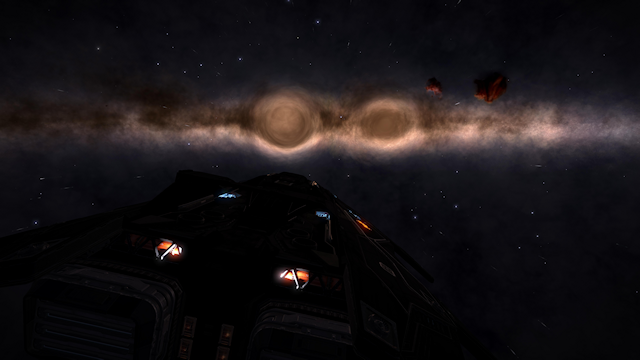 A neutron star with two metal-rich rings can be found in this system. 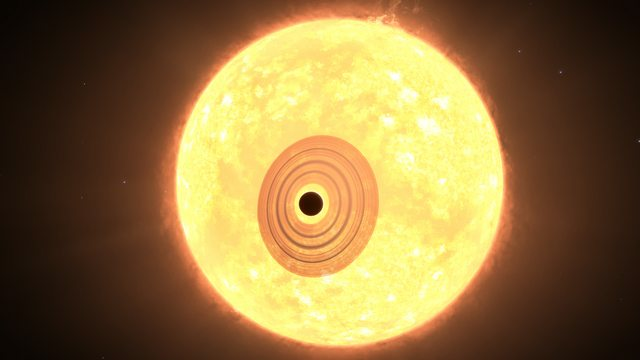 This unusual feature is a class-V gas giant located just 76 light seconds from a hot O-type star. 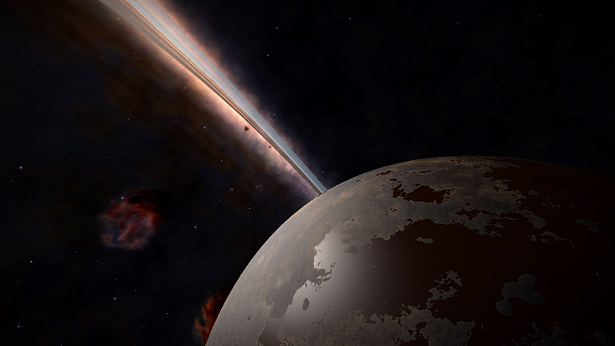 Instead of being blown apart by the intense solar winds, the gas giant emits a blindingly white glow. Explorers who venture too close to the object will find their instruments in total white out. The object's apparent surface temperature of 9456 kelvin should easily cause the object to fly apart, as it lacks the mass needed to form even the smallest of stars. This object is similar to The Mysterious Light ; both are currently unexplained by modern science. Starless Black Hole system with no additional lightsource plunging it's ringed gas giants and planets into total darkness. 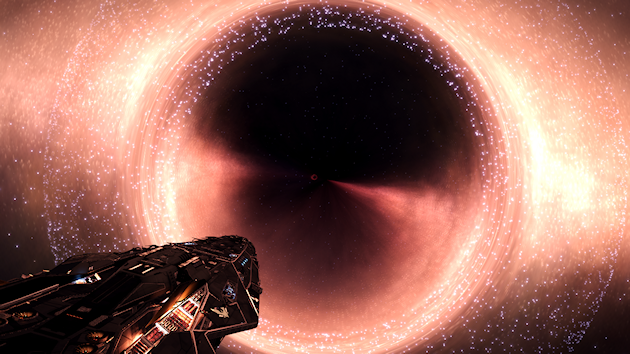 A large 48 stellar mass black hole roughly 100ly from Jaques Station. Visually quite impressive as you can see the whole 'ball of stars' effect even on hyperspace entry distance and impressively spectacular if you fly right up to the exclusion zone with the galactic center behind it. Fate and destiny. 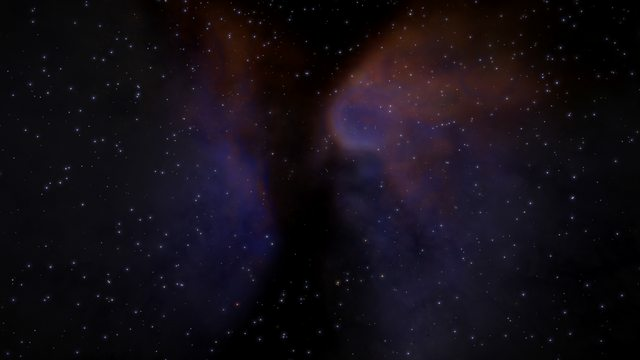 The Fortune Teller Nebula shows a different face depending on how it is approached. Approaching from the Core, the Nebula is a dark and pendulous red. From the other side, the nebula displays hues of blue and purple. Like the tent of a fortune teller, this nebula is dark but colourful. It is brighter on the inside, with shades of blue, red and orange decorating the night sky of its many worlds. Medium-sized, reddish-orange nebula which from certain angles is reminiscent of the mythical beast the Gryphon, which was a winged lion. A remote Wolf-Rayet star in the Fallows, first spotted by an old Earth astronomer. At over 1,300 LYs above the plane, it is reachable only by engineer-modified ships using FSD boost. 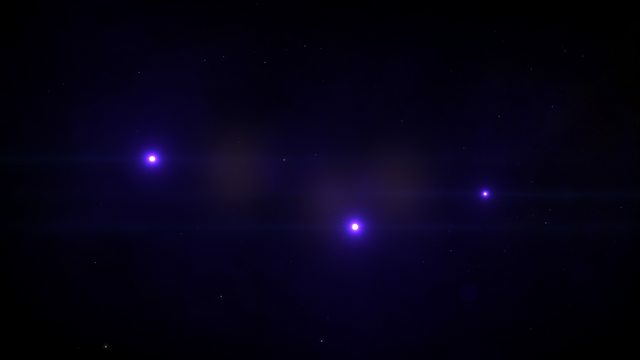 A system that only contains three black holes. 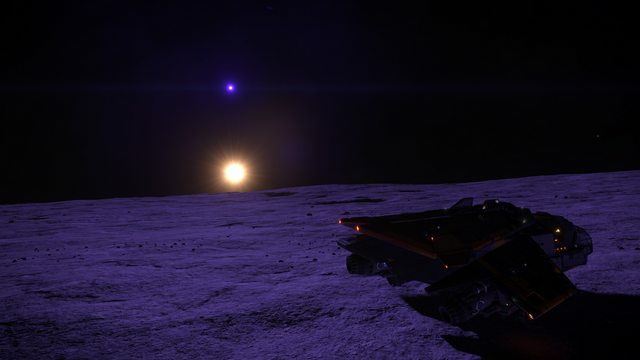 First discovered by CMDR Ripster. Two of the black holes are less than 0.01 AU from each other and have an orbital period of 0.1 D. The third black hole is fairly close by as well with an orbital period of 4.4 D. The central black hole has the mass of 29 solar masses. The three angels of death are named Abaddon, also called Apollyon, which is the destroying angel in Book of Revelation in the New Testament, Azrael, also known as Malak al-Maut from Islam, and Mot, angel of death from the Hebraic Book of Habakkuk. Two prominent nebula in the Cassiopeia constellation, approx. 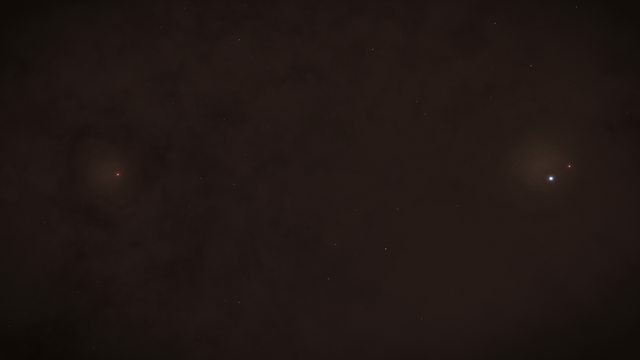 7,800 LYs from Sol and situated on the far fringe of the Perseus arm and right on the very near edge of the Formidine Rift. Approaching from the opposite side, these two nebula act as a beacon of light and colour to intrepid explorers returning from across the Rift. They are very well surveyed and the Soul Nebula contains a radio source named W5, although its exact location remains unclear as of 3303. The Soul Nebula is also named IC 1848 and the Heart Nebula is named IC 1805 (which may be confusing due to the IC 1805 Cluster). All objects are thought to be part of a giant molecular cloud within what is called the Cassiopeia Superbubble. Part of the IC 1805 cluster, this system is swarming with stellar objects. The high-mass O-type is in a nested binary pair with no less than three different black holes ranging from 9.4 to 31.3 solar masses. 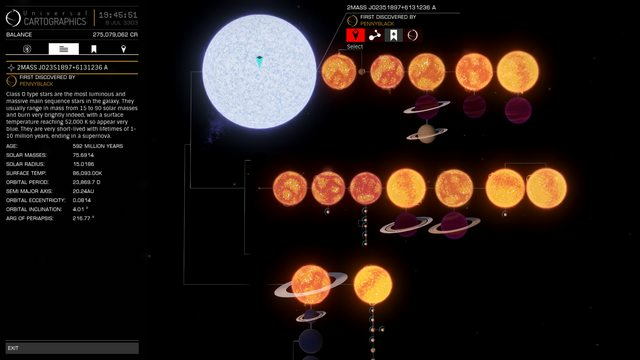 What really makes this system stand out are the five K-class stars and nine M-class stars, including one with a rare ring system. From the surface of one of the landable planets these stars will appear to flitter and fly across the sky during their orbits, giving the appearance of a field of fireflies. 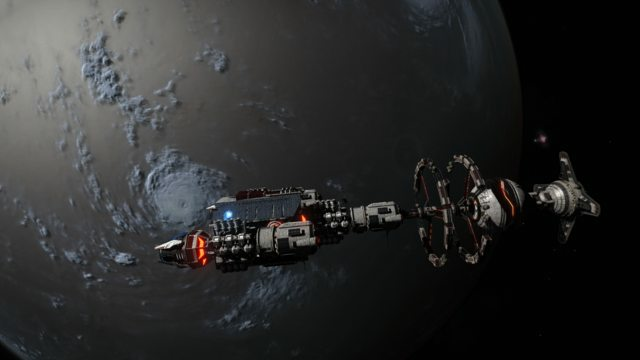 In the fall of 3301 the Explorers Association succesfully completed its campaign to establish Obsidian Orbital as the first permanent outpost in the Pleiades cluster. Unfortunately the Pleiades never became the peacefull haven for explorers and pioneers envisioned at the time. The Ant Hill Mob, a criminal faction, soon bullied the original crew of the station into submission and began using the newly constructed station for their shady affairs. 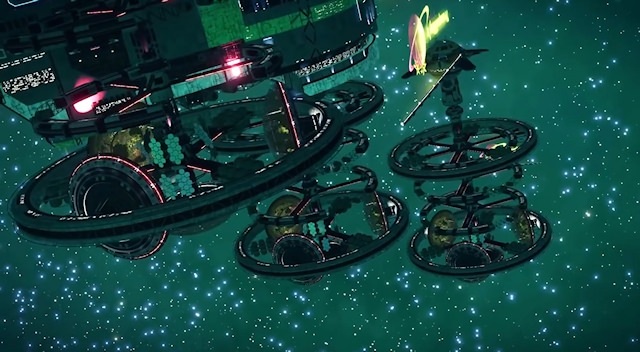 With the discovery of Barnacles and Meta-alloys, the Pleiades also got the attention of the galactic superpowers as well as several ressearch enterprises. 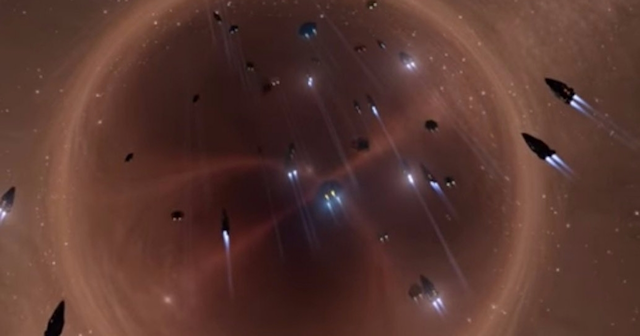 These days a multitude of groups and individuals struggle for dominance in the cluster, and this has lead to the establishment of a surprisingly large number of deep space outposts in the Pleiades. 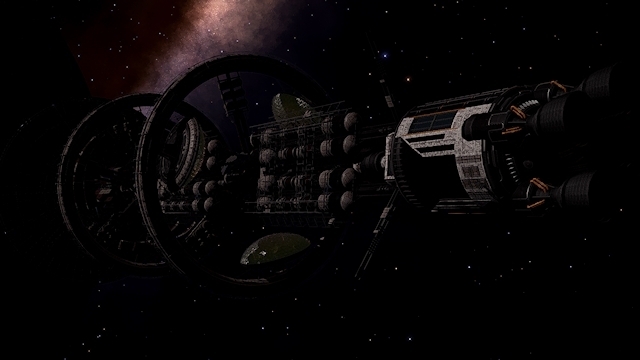 The generation ship Lazarus was discovered on September 17, 3303. It is located in Virudnir, and can be found orbiting the planet Virudnir 6. Have a drink at the Pellegrino's Bar!